I have wondered why, if Px is actually there, many do not see it. I also wondered why a camera might see what the eye does not. Here is a study performed this day May 10th, 2003. This is the first really clear day I've had in a long time. This is a dawn shot. Notice that there is no Planet X visible. However, there are also no clouds in the normal shots. Once the brightness and contrast of the digital photo is adjusted we now see that there is an obscuring layer of cloud moisture. The sunrise is only a minute old and a lens flare shows up in the lower right of the photo. No flare in the left side. This would be typical of others taking photos at this early morning angle. Many of the photos I've seen are of sun dogs, which are reflections of the bright sun on a backdrop of moisture. 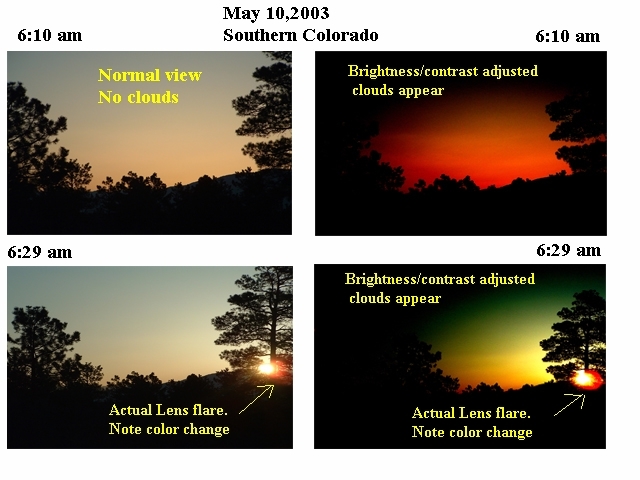 I have yet to see a photo of a red shifted morning object. This does not mean it is not there. It simply means I have not been able to discern it as yet.